Polygons can also be created in a 3D View. 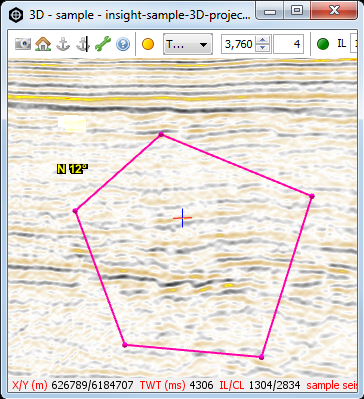 However, polygons are two-dimensional and must be traced on a selected inline, crossline or time/depth slice. Tip: A polygon can also be drawn on a 2D line in the 3D View. To do this, select a 2D volume and its respective 2D line to draw the polygon. In the 3D View, make sure you are at the IL/CL or horizontal slice that you wish to create the polygon. Adjust the IL/CL or slice by changing the values in the Navigation Bar in the 3D View. Click on the IL/CL or the horizontal slice to define the perimeter of the polygon on the selected 2D area. Right-click to finish picking. Right click to end a segment while picking. To add a new shape to the existing polygon product, click at a new location and begin picking. You cannot create another shape at a different 2D slice. To exit the picking mode, click the Pick polygon pencil icon. Alternatively, double-click or press Esc to disable polygon picking in the 3D View. Note: The 3D View also displays other polygons drawn on the map and section views. Hide the display of the polygons by clicking the green circle at the polygon item row in the Polygon tab in the Control Panel.